James stated in the New Testament, “The prayers of the righteous avail much!” But what happens when your prayers are hitting a glass ceiling and you’re not experiencing the breakthrough you expected? Do you fizzle out in faith? Do you grow discouraged? The posture of our hearts is the plumb line to the releasing of our miracles and petitions. God searches the motives of our hearts to test if what we’re praying for is in alignment with His will and Word or if it is in alignment with our hearts’ most deceptive and destructive desires. It is through our intimacy with Him that all crooked paths are made straight and we take back our spheres, cities, and regions for the glory of God. Learn the difference between praying in your nature vs. your identity. Learn why many churches won’t tell you who you really are in Christ. Learn the inside intel of how satan runs his kingdom. I decree and declare that this book will sharpen the sword I your mouth, and you will begin to see immediate results in what you have been believing God for. A King Shall Decree a Thing is a book for all believers who are ready to walk in their spiritual DNA and identity in Christ so that they can live in a realm of power, authority and endless possibilities. The prayer starters, decrees, scriptural references and breakthrough declarations will awaken the King on the inside of you, thus empowering you to partner and ascend to the courts of Heaven where you can hear and prophesy the verdict and edict of the King-Judge (Jesus Christ). 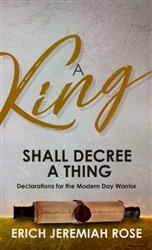 Ecclesiastes 8:4 declares, “Where the word of the king is, there is power . . .” and this book will help you to do just that! This is a must read for every person who desires to speak a thing and see it come to pass! Rose has given us the tools within this book, and we should readily apply them. He lets us know that, as children of the King, we have a divine right to faithfully speak our blessings into manifestation. We don’t have to live like paupers! We don’t have to be enslaved by a nine to five. Erich blows the lid off the strategy of the enemy to keep you small in this season. This book will be one that you will revisit, mark up, highlight and wear out due to the content within. Be prepared to have your outlook changed and see results when you decree a thing! Erich Rose is the senior leader of Adullam International Ministries in San Marcos, California, alongside his lovely wife, Minister Cynthia Monroe Rose. Dubbed as an “apostle of dreams,” Erich’s grace has allowed him to pour into many leaders, believers, and unbelievers’ lives by teaching them how to decode their dreams and visions. He and his wife are sounding the alarm in the Kingdom of God by introducing the love of Christ to lost souls, both local and abroad. Erich and Cynthia reside n Escondido, California and have a beautiful blended family of seven children and two beautiful grandchildren.